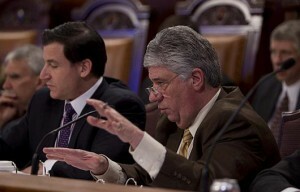 HARRISBURG, February 23, 2012 – State Sen. Wayne D. Fontana (D-Brookline) has enlisted the support of state Transportation Secretary Barry Schoch in his efforts to broker a lasting bipartisan solution to the state’s transportation funding crisis. Despite extensive funding recommendations from his own Transportation Advisory Commission, Gov. Tom Corbett has offered no proposal or idea on how to fund billions in repairs to Pennsylvania’s faltering bridge, highway and transit systems. Schoch, however, agreed to work with Fontana to find a long term solution. During direct questioning from Fontana at yesterday’s PennDOT budget hearing, Schoch said all stakeholders would need to come to the table on transit funding — including management, union representatives and officials from all levels of government. Facing a $64 million deficit, the Port Authority of Allegheny County has threatened to reduce service hours and routes by 35 percent – as well as hike fare rates. Although ridership is up, this would make it the largest cut in the agency’s 48-year history. Fontana said other transit systems across the state face similar funding problems. “People rely on mass transit to get to work; and businesses need mass transit to survive,” Fontana said. “For many of our struggling river towns, transit access if a lifeline. Seniors rely on mass transit to get to doctor appointments and many children depend on the Port Authority to get to school.